Journalist Deletes Her Account After Tweeting "It's About Time For A Presidential Assassination"
Late Tuesday night as the results of the Presidential election were still rolling in, a freelance journalist known for her work with the Guardian tweeted something incredibly controversial that sent the internet into a frenzy. 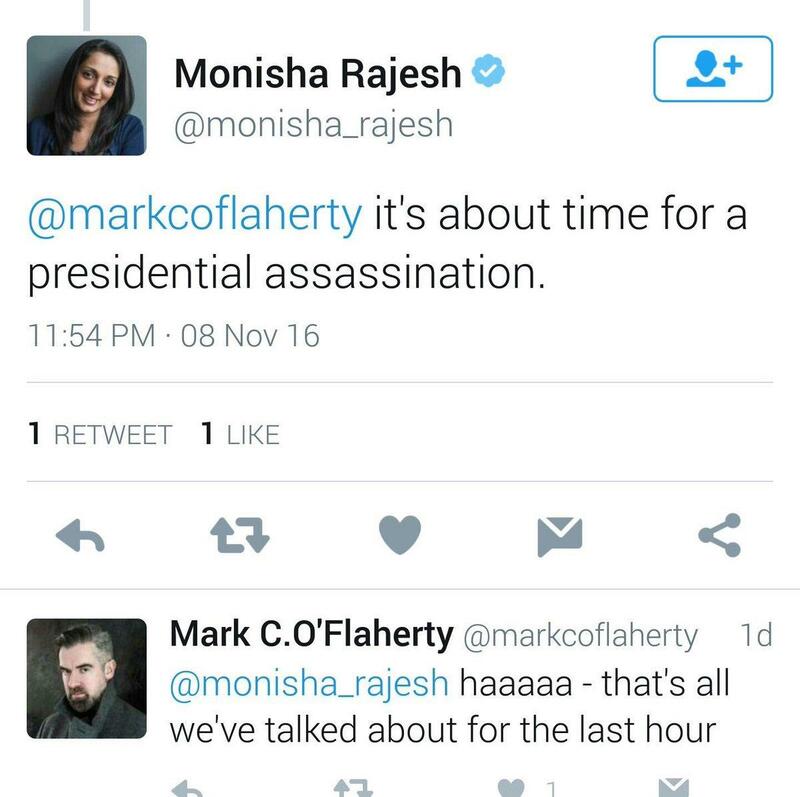 At 11:54pm when it was becoming clear Trump was going to be the one to win the presidency, Indian writer Monisha Rajesh tweeted “it’s about time for a presidential assassination.” Though Rajesh ended up deleting the tweet and subsequently her account, Twitter users were able to capture her threatening statement so the evidence could be held against her. While threats against President-elect Donald Trump have been seen across the internet since the results came in, Rajesh’s statement was most damning. This is because other online agitators who dared to say such bold words did not have a blue verified checkmark next to their name to signify they were a legitimate and reputable source. The Twitter user she tagged in the tweet with the threat was Mark C. O’Flaherty, a Finance writer for the Telegraph, one of the many publications Rajesh contributes to. He originally tweeted at her “I have no words…always wondered when a Nazi-scale atrocity would next arise. here it is…Here it is…” before she made the assassination suggestion. He responded to her threat in a lighthearted manner, also not considering the severity of their words. “haaaaa – that’s all we’ve talked about for the last hour” O’Flaherty tweeted back. Other users saw the back and forth between the two writers and fought back against the dangerous rhetoric. Soon after they received backlash, O’Flaherty changed his Twitter handle and Rajesh deleted her account. The Guardian, where Rajesh is a featured writer, told the Daily Caller, “Monisha Rajesh is an infrequent freelance contributor, not a staff writer, and the Guardian cannot take responsibility for comments expressed by her in a personal capacity.” The Daily Caller also reported that The Telegraph had yet to respond to a press inquiry about what disciplinary actions, if any, would be taken against Rajesh.